the opportunity to experience the lonCleanse® process in the comforts of their own home. AMD = A Major Difference! and a 60-day, 100% money-back guarantee. The IonCleanse® Solo® machine is constructed using the same quality of components as the IonCleanse® Premier® unit. Because of the volume of sales of the Solo® unit, we are able to take advantage of volume discounts on parts and components and pass the savings along to the consumer. Additionally, the Solo® system outputs the same current into the water as the Premier® machine. A 30 minute session with the Premier® on mode three will yield the same results as the Solo® for 30 minutes. The single program on the IonCleanse® Solo® system is a 70/30 mix of negative ions to positive ions. This program accommodates most users and is ideal for the lay person. Should your IonCleanse® by AMD have a manufacturer's defect, AMD will overnight a temporary unit to you (*available to US residents only) and provide you with a prepaid return service for your malfunctioning unit. Overnight Repair Service coverage may be purchased above. 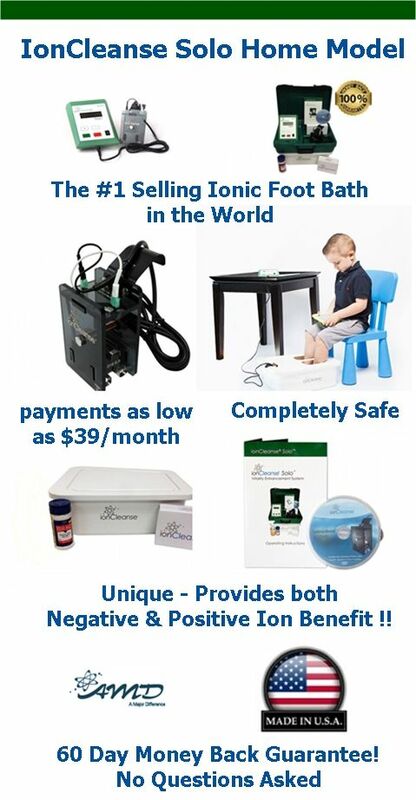 The IonCleanse® Solo® package comes with a 60-day, 100% money-back guarantee. If you are not completely satisfied with the results, or the machine's performance, simply return the package within 60-days of your purchase for a full refund (less shipping fees).See our A+ rating with the BBB. Never publish dirty markup code and double check your content before publishing a web article!